*Sigh*, the never-ending indecisiveness of where to eat. Does the following scenario sound familiar? You’re with a group of friends excitedly discussing options, however, you’re experiencing difficulty because while there are several hungry people, no one can make a decision. You finally just end up going to an old favorite because it’s just easier. Don’t get me wrong, the old standby has its place, but sometimes you just want something different. There’s risk to that too; maybe you try that new place that everyone has been raving about only to wind up not feeling it. You just wasted your evening and your money! I hate when that happens. I’m by no means being overly dramatic in the scenarios above. Studies show that Americans dine out an average of 4 to 5 times per week; decisions, decisions! Choosing where to eat is overwhelming sometimes, especially in Chicago, which was recently named The Restaurant City of the Year by Bon Appetit Magazine! There have been times when I just wished that someone would just tell me where to go. That’s why I was excited to hear about the launch of a new app named Clueless which was designed to do just that! Clueless will assist you in your choice overload by acting as your restaurant matchmaker. It’s tailored specifically towards your tastes, giving you a percentage match on the probability that you’d like a specific place. I was recently invited to attend the launch at Joy District in Chicago’s River North neighborhood. Immediately intrigued, I was excitedly looking forward to the event! The launch event was my first time at JOY District. If you’re looking for a sweet rooftop in the city of Chicago along with creative cocktails, they’d be one to check out. Their rooftop has been named one of the best in the city by several media outlets. It did not disappoint; the views were splendid! Specialty drinks and hors-d’oeuvres were making the rounds while we waited for introductions and the deets on the new app. The make-your-own-smores bar and I got along great! Clueless was created by Shea Maunsell and her partner Luca Graglia. Shea has a background in digital consulting sales and her partner Luca comes from a computer engineering background. 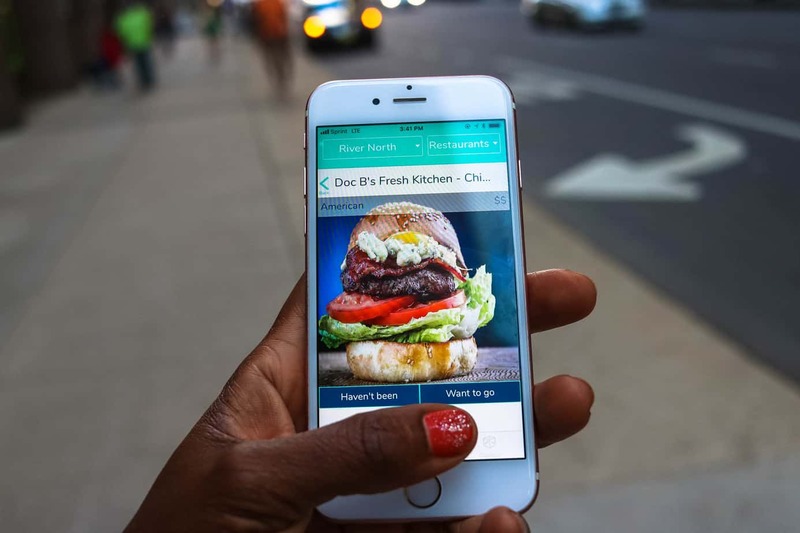 The idea for the App sprang from Shea’s desire to have more personalized restaurant recommendations. She and Luca discussed this while brunching at Clark’s Diner and decided to make it a reality. Shea told me that they made many monumental decisions at Clark’s Diner. It’s a favorite of theirs and holds many memories. Whereas most apps take 6-8 months to develop, Shea and Luca aggressively went from concept to launch in 5 weeks. It was a wild ride with many steps and hoops! Fortunately, she had an amazing team of supporters throughout the process. She made sure to call attention to the incredible tribe of women entrepreneurs who have been her backbone. Just to be clear; this App is not reviewing restaurants. It’s grouping restaurants according to your preferences. For example, if a restaurant’s atmosphere is a priority for you, it will make recommendations based on that. Choose a neighborhood that you’re familiar with; this will assist the app in giving you the best recommendations. Select your category: either bars or restaurants in that neighborhood will appear. If you have been to a place, swipe to give your opinion. Left to dislike and right for like. If you haven’t been to a place, select ‘haven’t been’ or ‘want to go’. Based upon this the app will give you a percentage of probability that you’d like a restaurant that you’ve never been to. Still too many choices? Roll the dice and have the App just tell you where to go! When I rolled the dice I was directed to go to Troquet, a French restaurant in River North. I obliged as I’d never been and wanted to test to see if it was a good recommendation. It indeed was a good recommendation! My friend Robea and I recently enjoyed a lovely breakfast there and everything from the food to the service was on point! Actually, the friendliness of our server was so noticeable, I referenced it several times during our meal. I ordered the Troquet Omelette which consisted of roasted mushroom, tomato, spinach, Camembert, and Béarnaise. The Béarnaise sauce on top reminded me of hollandaise sauce but better. The crispy potatoes that accompanied had a nice even crisp without drying out the inside. I’d definitely order that again. Robea ordered the pancakes which came with a Champagne sabayon on top with berries. The pancakes were yummy; we only wished that they came with more of the light, frothy, sauce. We did end up getting extra, I think that I’d drink that sauce! We both agreed that the cappuccinos were excellent as well! In this instance, Clueless matched me with a great restaurant and I’d like a second date, lol! Be sure to download the App and give it a spin. The more you use it, the better and more specific your results will be. Have you used Clueless? Tell me your experiences in the comments. Wow Flo-you are so so talented! Thanks for the amazing post on Clueless. Now I have to go Troquet, too! You’re welcome Shea! I love Clueless and I’m so excited to see where it takes me next! Definitely check out Troquet…FYI, it’s a good spot to take your laptop and work too! Hahaha, I could totally use a restaurant matchmaker. I never know what I want to eat and the decision can become painful. Thanks for sharing this cool app! This is an amazing app! I’d love to have it for NYC! Looks like I’ll have to tell my friends who live in Chicago all about it! Hopefully it’ll be available to you in NYC in the future. So far it’s available only in Chicago. Hopefully, in the future it will be available everywhere. Clueless is more personalized to your individual tastes. Based upon your input and likes the percentage and recommendations are strictly geared towards you. I’ve heard it refereed to as TINDER for restaurants, lol. This app is a great idea! I would like to try it myself. Nice review and superb photography. Thanks, make sure to let me know what you think after trying it! This is awesome! Downloading this app right now! Previous PostRed Arrow Taproom: A Craft Beer Fest Everyday!